A New Year means a new goal for your business. These are some simple tips to set yours this year. Where did the last year go? It seems not too long ago I was writing a post welcoming you in to 2016 yet here we are in the first month of 2017 thinking about the year ahead. With the new year many of us will be coming up with new year’s resolutions, linked to either our personal lives or to our business. It is a guarantee however that we will lose our focus on that resolution and will either resort back to previous behaviours or lose the motivation to continue. That is why we shouldn’t set resolution. Instead we should be making new year goals. Goals give us something to aim for and just the world goal creates a much stronger need to achieve it compared to a resolution. The English dictionary states a resolution as ‘a firm decision to do or not do something’ where as a goal is ‘the object of a person’s ambition, an aim’. Giving ourselves a clear goal creates the ambition in us to achieve it, while keeping us on track. So how do we pick a goal? A goal is anything you want to achieve in your business. From taking on so many new clients in the year, to a certain number of sales maybe it is just to organise your in-house systems to become better efficient. Make your goal as specific as possible, it will be easier for you to come up with a plan to achieve your goal. Think good and hard about what it is you want to achieve more than anything in your business then create an amazing graphic with it in writing. Print it and place it in sight of your work place, next to your bed and even on your fridge. This way you will never lose sight of your goal, literally! Also, understand you reason for wanting to achieve that goal. No point saying you want to improve your in-house systems if you do not have the benefit to you and your business at the fore front of your mind. You are more likely to lose focus if you cannot see the benefit of the end result. How do I start achieving my goal? Once you have your goal everywhere you can see it and believe in it you need to start working on how to achieve it. The simplest way is to research the necessary tools needed to achieve those goals. If unsure ask in Facebook groups, or business owners in the same industry. With the right tools and knowledge on how to achieve your goal you can then break it down in to the sub goals. These sub goals should be manageable goals that focus on a particular aspect of your main goal. For example, if you wish to monetise your blog a sub goal could be to enrol in a course to learn how, or to join an affiliate programme. It is then like a ball rolling down a hill, the more you achieve towards your goal the more momentum you have to fulfil it. Keep your list of sub goals near your working area and celebrate each one that you have achieved, you will deserve it. Think of them as mile-stones. Every quarter re-evaluate what you have accomplished and what you still need to do, it may be that you have found a more suitable tool, or learnt something new that will make achieving your goal easier. If you find your business may have changed direction and therefore so has your goal, adjust your sub goals list and continue on with your new plan. At the end of the year no matter whether you have achieved your goal or not, celebrate the fact your business has grown in the last 12 months. Analyse what you did and didn’t accomplish, then use what you have learnt to start setting the goals for the next year. 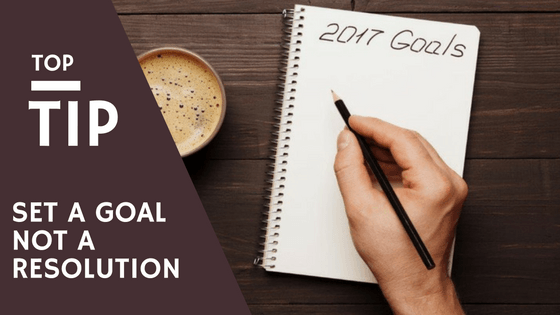 If you want an accountability partner or some help setting those goals, join my 2017 goal setting post on my Facebook Page and lets get your business growing!